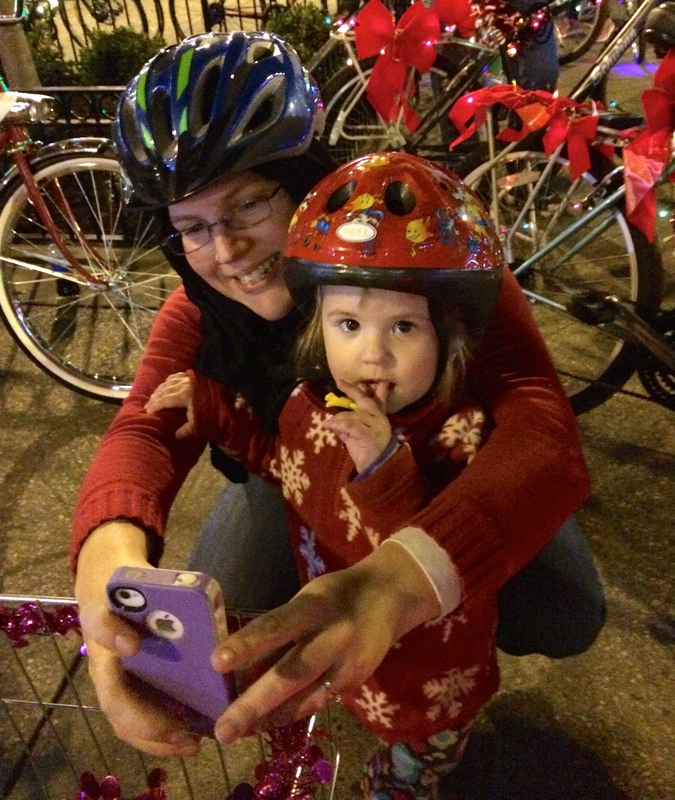 Bike it and shine on: Knoxville’s Tour de Lights 2014 | Oh, the Places We See . . . 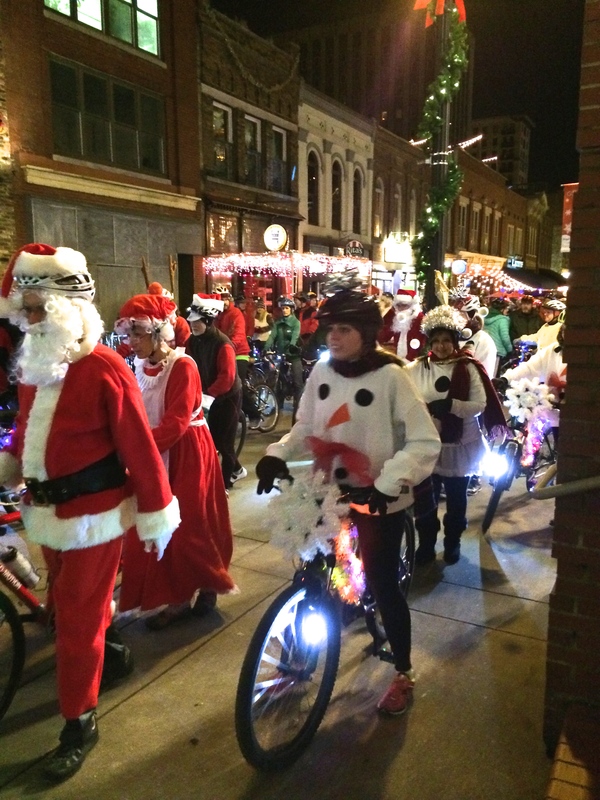 If you’ve ever wondered what 1,000 lighted entries in a bike parade would look like, come to Knoxville’s Market Square right before the official start of Tour de Lights, a newly-designated (and proud of it!) 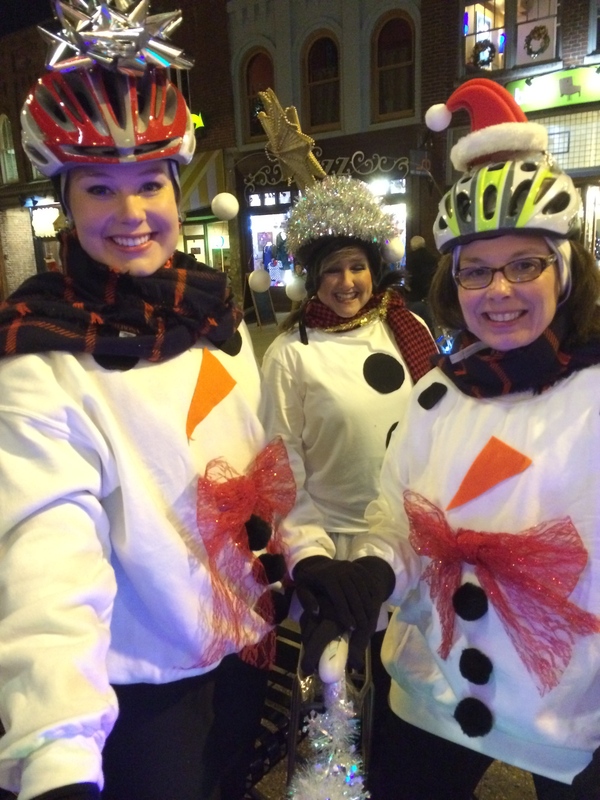 Christmas in the City event. 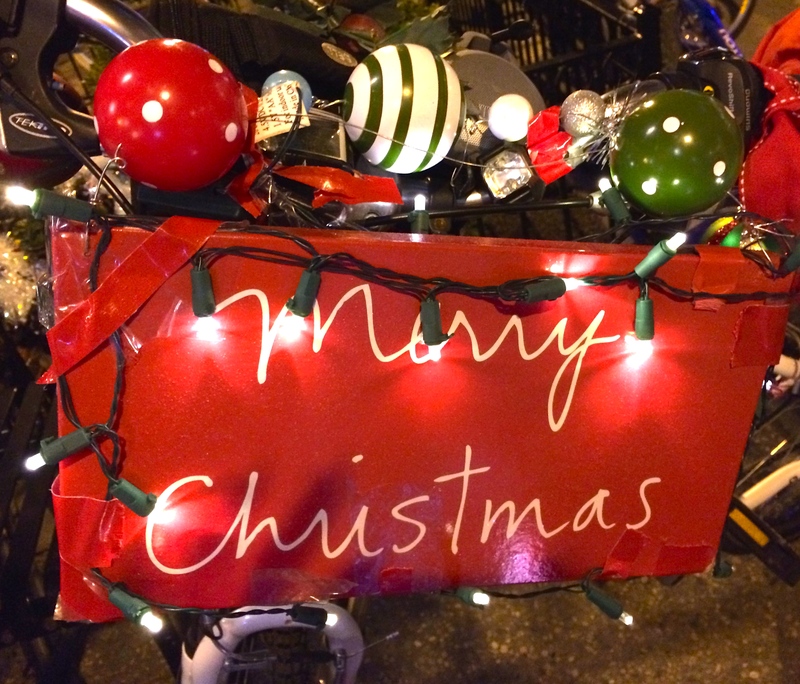 From humble beginnings of about 100 bikers eight years ago, the ever-growing bike tour sees creative riders putting as much time and creativity into one-upping their own festive attire as they do adorning their bikes. Take a look at what we saw. 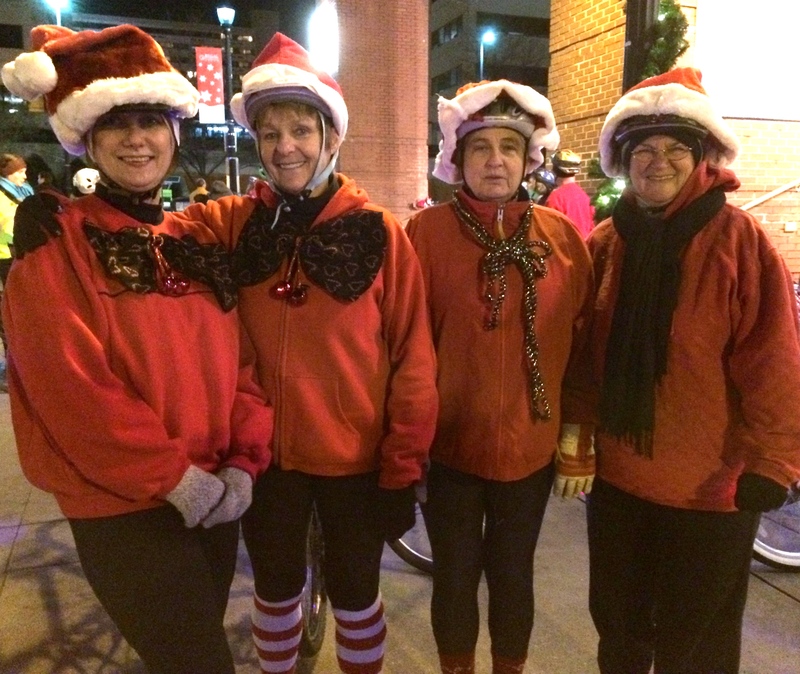 Scott West called it “a Dr. Seuss parade” (“Spin city, holiday style,”Knoxville News-Sentinel, December 20, 2014) running from Market Square through Fourth and Gill to Old North Knoxville and back. 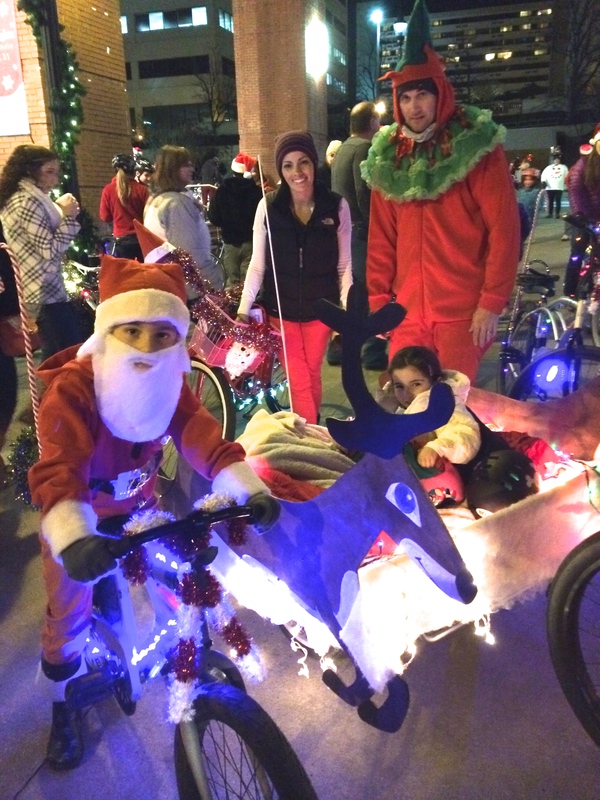 And it’s got to be the wackiest, “bestest” five-mile Tour de Lights in the South! As you would expect, Santa Claus and the Missus were there . . .
as was a team of red riders from Loudon, Tennessee . . .
and a merry band of snow women! 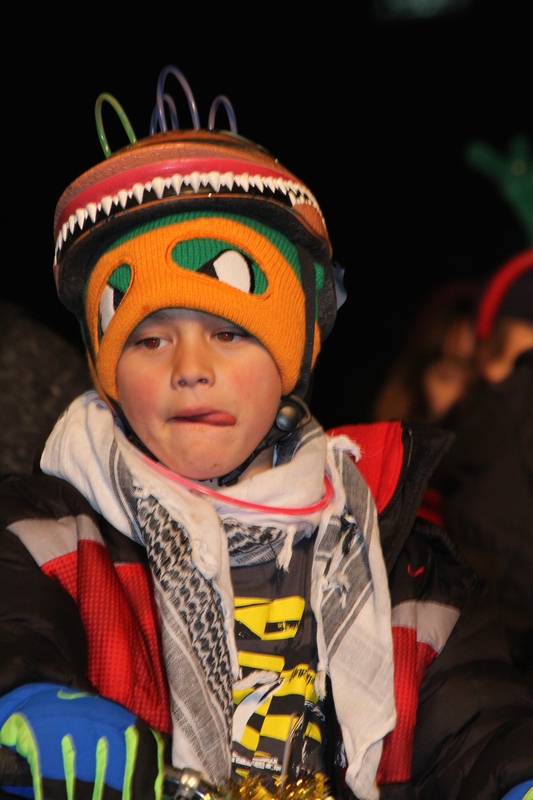 Little kids seemed mostly an afterthought, overshadowed by the funky, dazzling, grown-ups on the scene. Some young riders just looked around and “hung out” until Start Time was announced. Others became half of a Selfie Duo whenever Mom could get ’em to hold still and look at the camera. 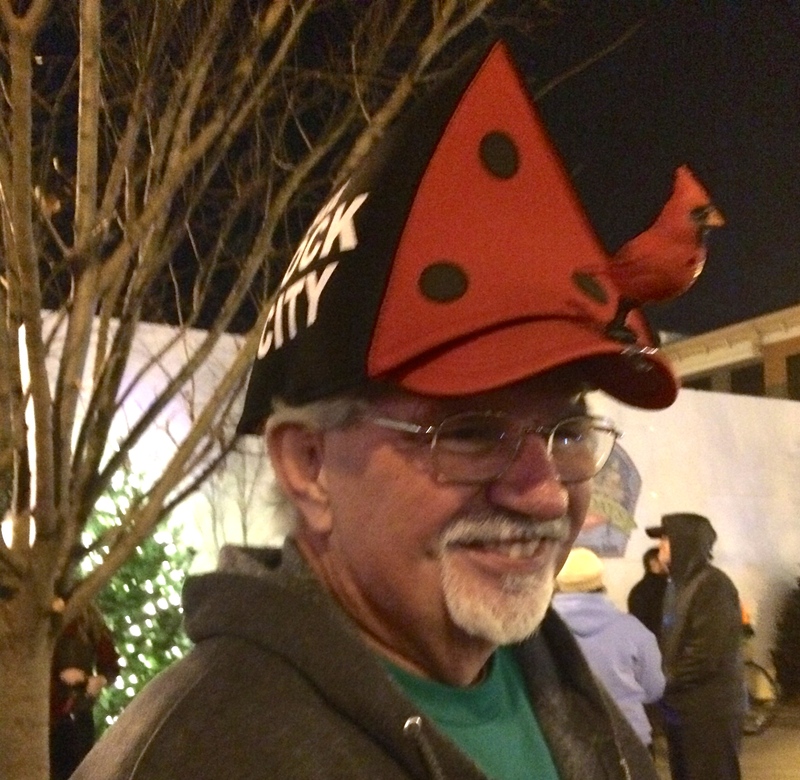 One man wearing a See Rock City birdhouse just smiled as he and his cardinal mostly watched the action on the square. 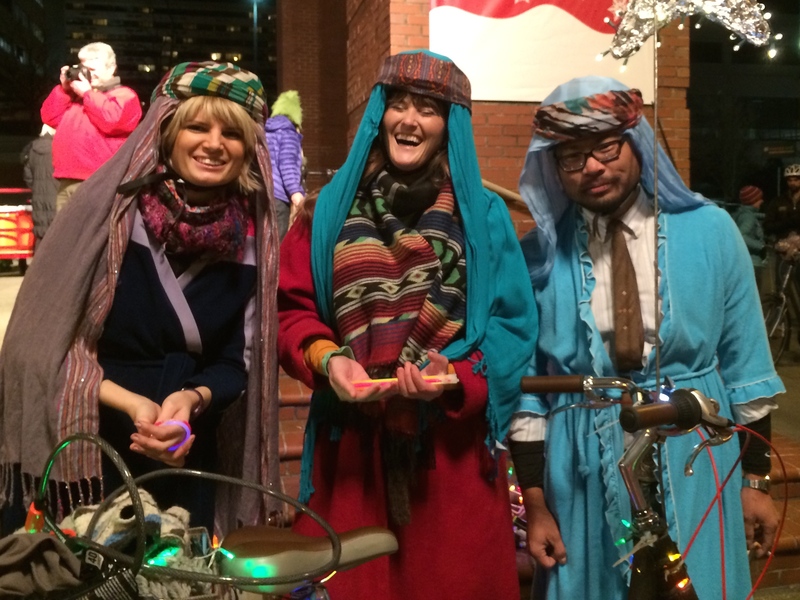 We couldn’t remember if these three riders, the only Biblical ones around, represented “We Three Kings of Orient Are” or Three Wise People. Didn’t matter. They were having fun being kingly and silly at the same time. Ellie Faul, Jennie Andrews, and Saul Young in search of the big star! 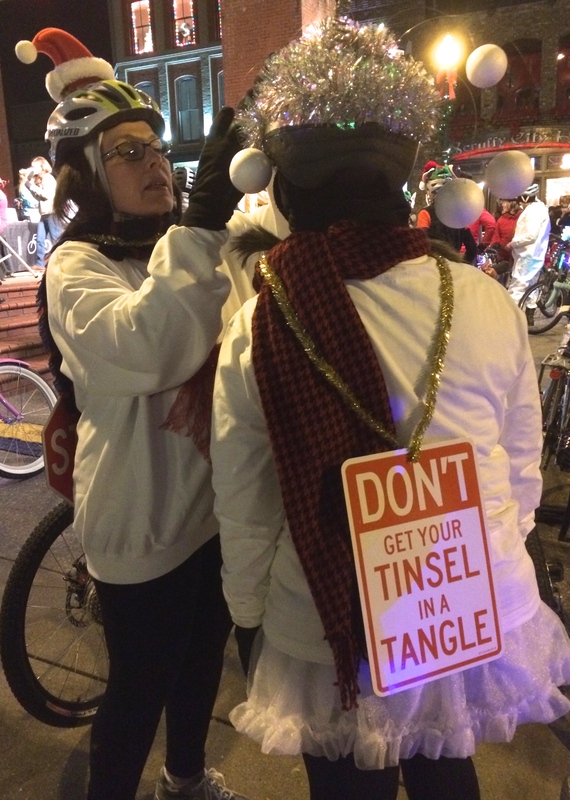 Some bikers like this lady with the sign needed a little untangling . . .
and this duo decided that the couple who rides together stays together. Looks like a great kick-off to a long marriage to us! A whole family joined the fray with an able son riding his own bike while his little sibling got a ride-along from his red-and-green parents. Not a bad gig, if you can get it. 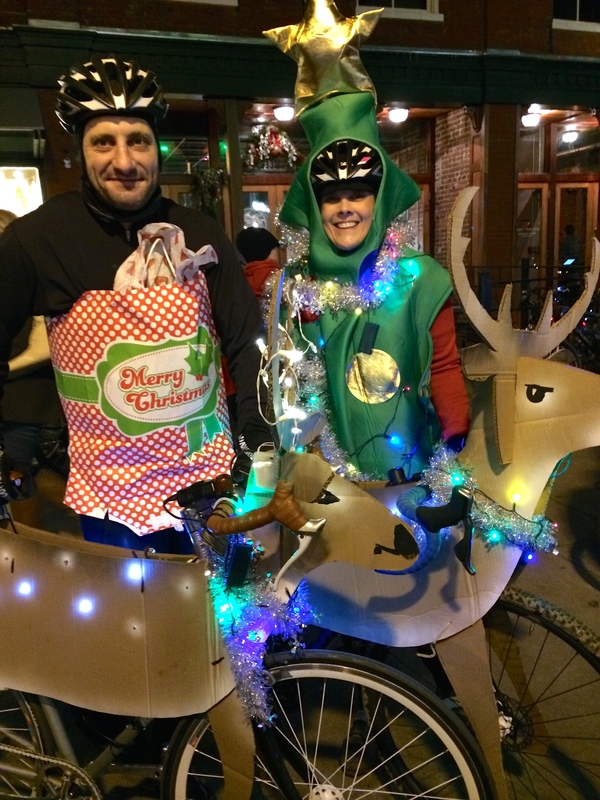 Our favorite costumes had to be from this crafty couple — a tree and package duo — whose bikes morphed into reindeer with a little help from some corrugated cardboard, battery packs, and lights. Finally the announcement came from organizer IBIKEKNX.com: Line up. We’ll start in five minutes. And line up they did. 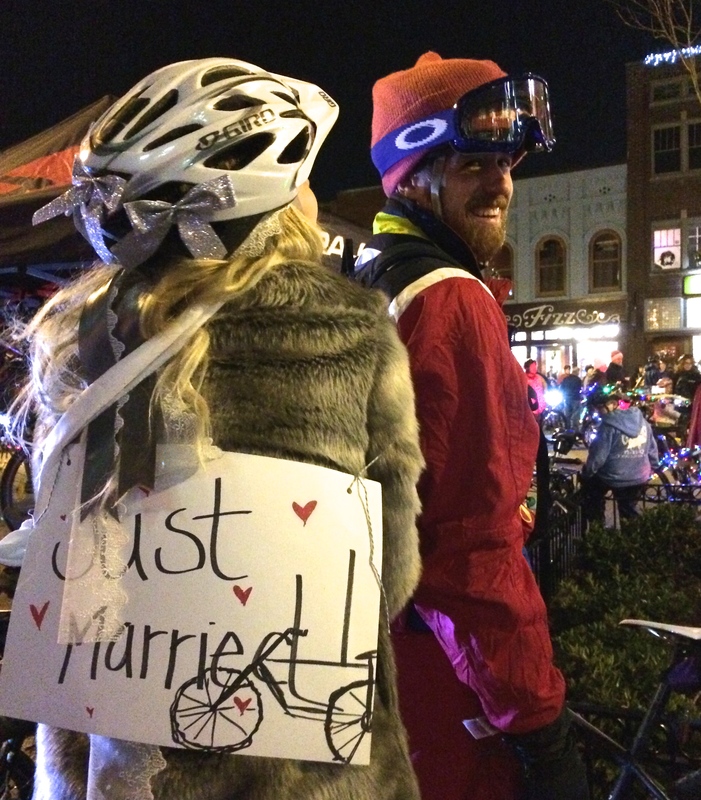 While we sipped free hot chocolate passed out by Mast General Store, young and old, colorful and twinkly, and everything in between started moving toward the start near Gay Street. We couldn’t follow along after that. But next year, we may locate a cozy spot along the route where we can stand and cheer ’em on. 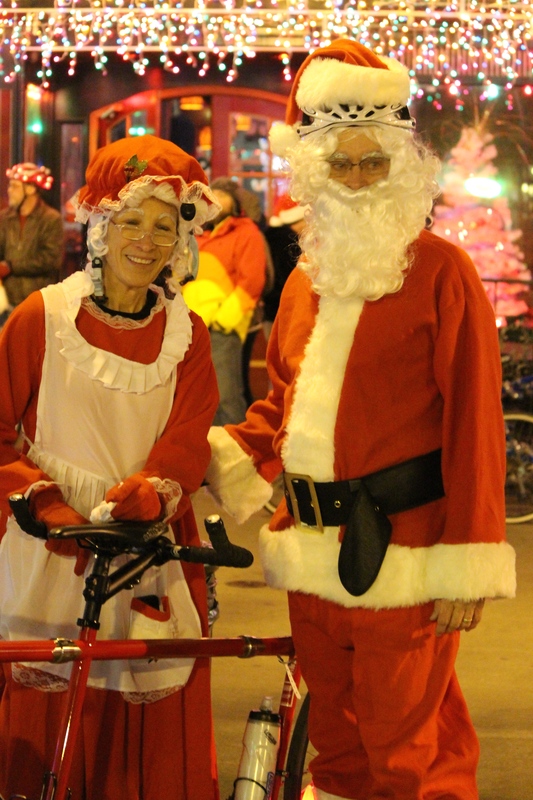 After all, what a great way to join our hometown in the Christmas in the City celebrations! 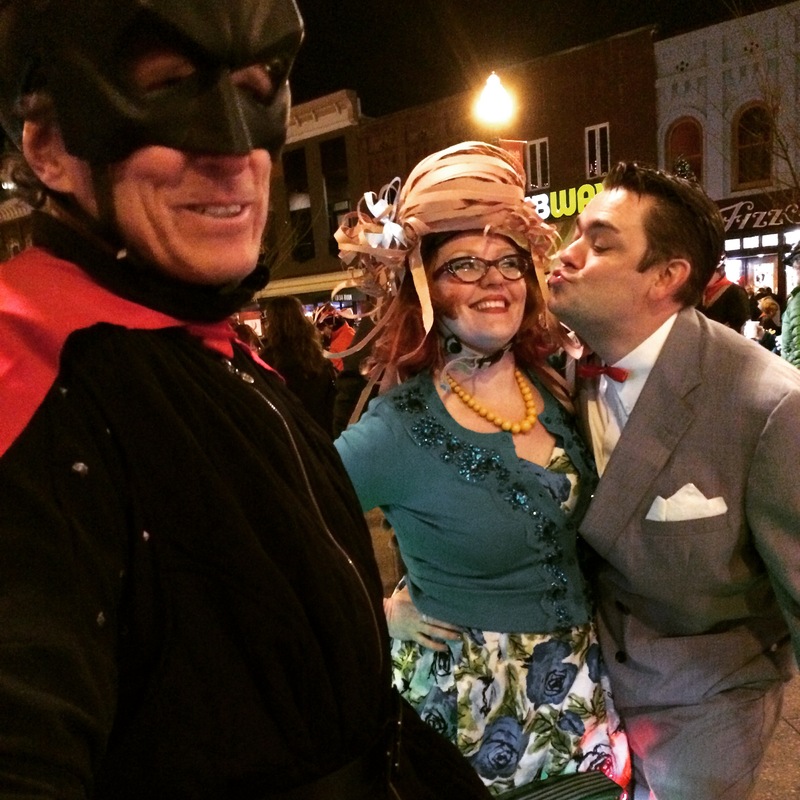 This entry was posted in Destination, Tennessee, Travel and tagged Batman, Christmas in the City Knoxville, IBIKEKNX, Market Square, Mast General Store, Miss Yvonne, Pee Wee Herman, Tour de Lights. Bookmark the permalink. Thanks so much! It was a warm event — everyone was having fun and great laughs. But not a warm evening. Thank goodness we had hot chocolate. Thanks for visiting and commenting. Merry Christmas to you, Rusha! Not sure how I missed this nice comment, Amy. But in catching up with correspondence tonight, I wanted to say thanks for always being so positive. Hope your Christmas and now your New Year have both been great! Thanks so much. So glad we’ve found each other’s blogs! It was really, really fun. We had cold weather, but no rain, so the bikers told us afterward that this was one of their favorite runs. Hope we get there next year. Have a great Christmas and Happy New Year! I’m so happy you all had so much fun! Lily, thanks for reading and commenting! It’s always fun watching others enjoying something our city puts on. This is a fun event, and judging by the turnout, one that many, many people enjoy. Hope your holidays are good! Curt, we’d love to see Burning Man — the people, the costumes, the event. Keep us posted if you go again. Thanks for commenting. 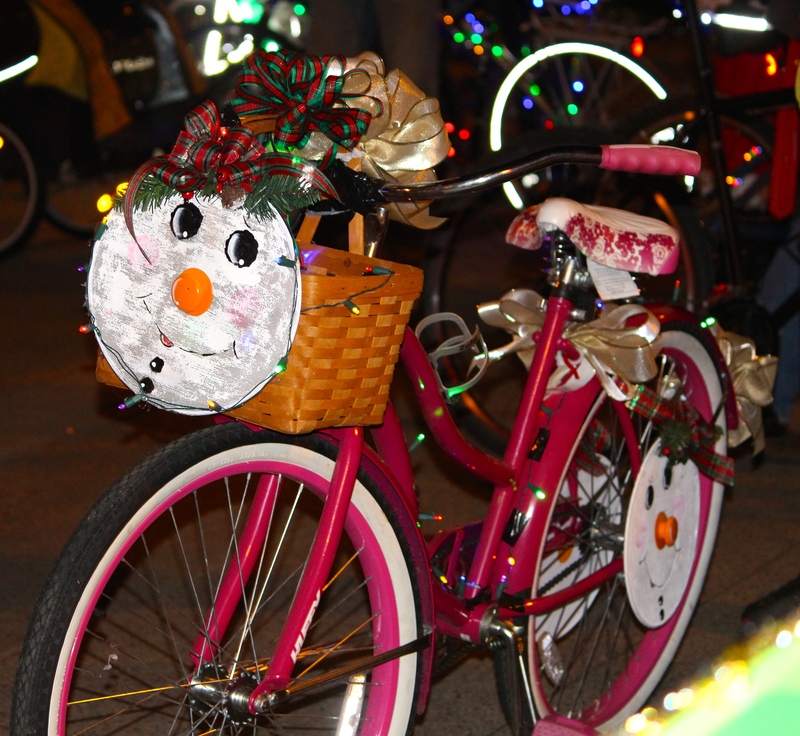 The bike event was great for Knoxville! It certainly looked like people were having fun. Thanks, Cindy. It was a fun night. But then we didn’t do the hard part — the bike ride in the cold!! !